As for supplies DO NOT SKIMP, when the kits arrive, take your detailed list of materials/tools needed in the instructions and buy exactly what’s on that list at one of the big box stores. Get the disposable buckets, the plastic, 3M Tape, etc. (except buy an extra three rolls) Totally worth it, if you’re busy like us and want your project to go as smooth as possible. 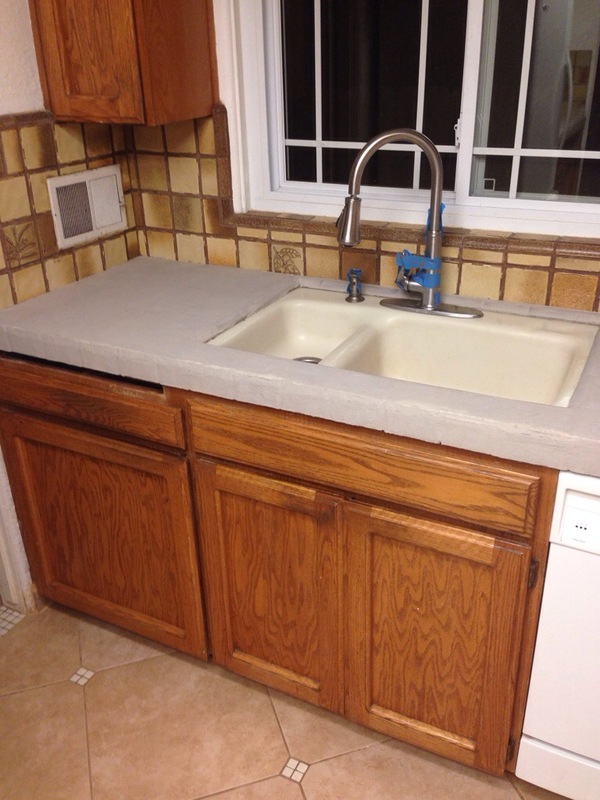 As for prepping we had our electric cooktop removed since we needed to update the electrical with a junction box, however we did leave our semi-under mount sink in place. 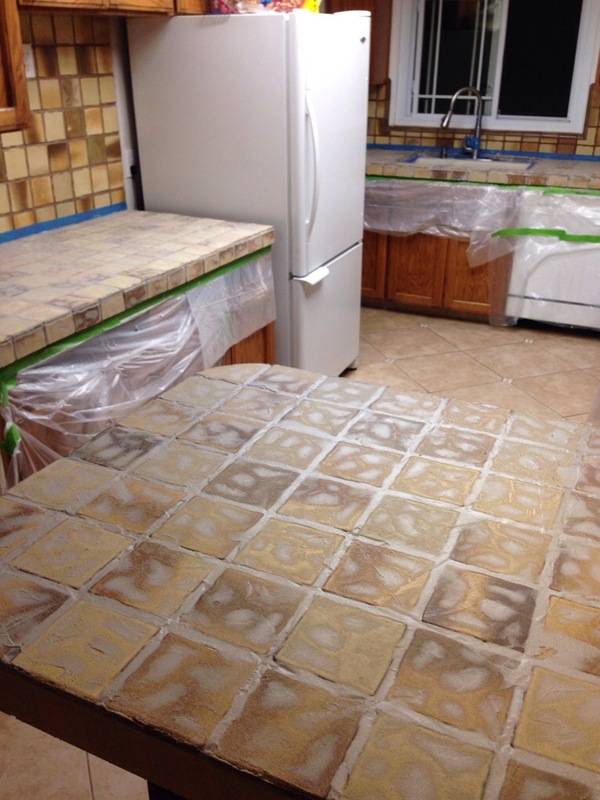 Next came the task of degreasing 30+ year old tile. 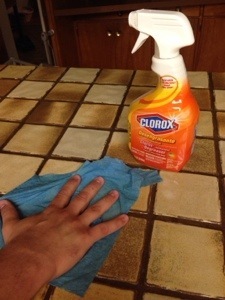 Luckily we found the Clorox degreaser to be fine and didn’t need to use TSP. 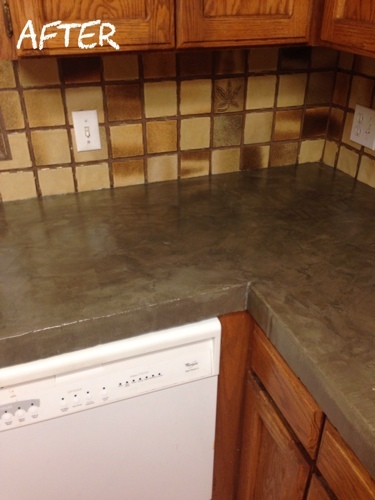 Now unfortunately we had a hiccup in our process that many will hopefully not encounter…Its called 1970s nearly a 1/4-1/2 inch, wide and deep grout lines with “textured” tile. 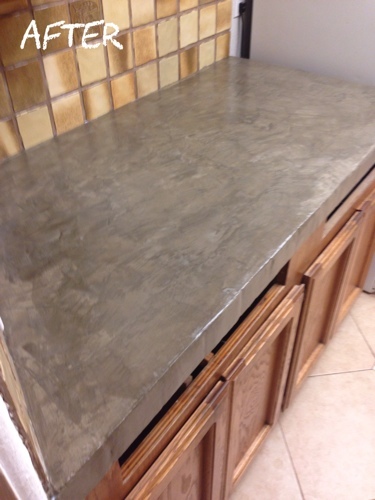 See the grooviness after our first application of super bond. The laminate still only needed it’s two normal layers and looked of course fabulous. As you can see in the pics we found removing the tape and plastic between the kit’s “Days” to be very helpful, it kept everything cleaner and felt less like a project zone. 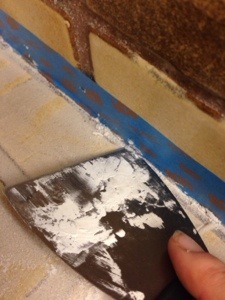 Also the basic four inch putty knife was the best for sanding/scraping away excess build up and smoothing out the super bond. 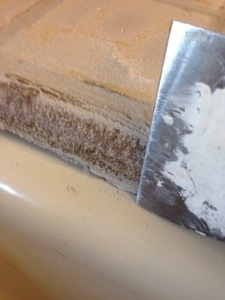 We lightly scraped at a 45 degree angle and it seemed more effective for us than the sandpaper, but we still used both. 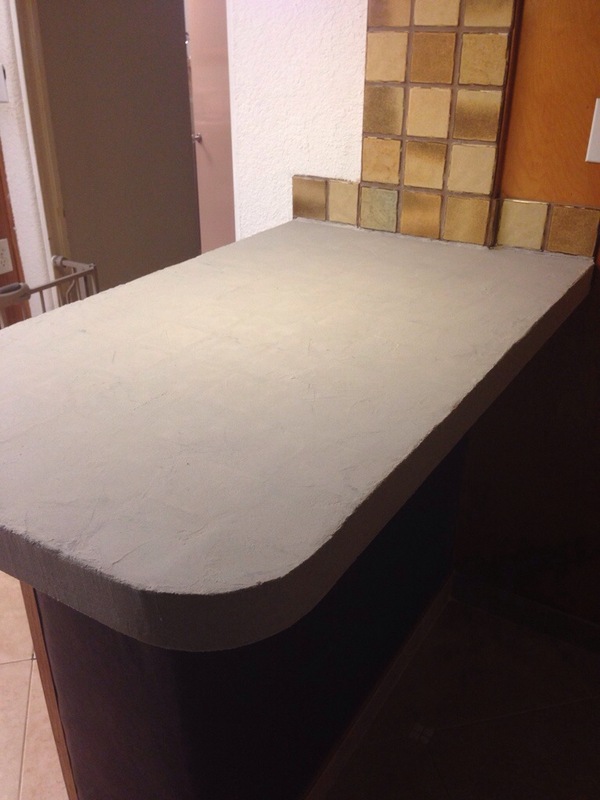 The sealing was the easiest and only took us a couple hours of applying and dry time Sunday evening. We found to be a great technique through the “Day 2” and “Day 3” process if working with another person, is one be the “applier” and one be the assistant kind of like a surgeon needs someone to hand him a scalpel. The person who’s taken the most ceramics and art classes should probably be the “applier” since the materials are different than the super bond. The “assistant” in our case was the dog wrangler, cleaner, troubleshooter, tool assistant, supply handler, etc. One person can probably do the entire project on their own easily but we found it to be faster with the both of us using this technique. WEDNESDAY:Prep, clean, and apply first layer of Super Bond in the evening afterwork, then allow to dry overnight and next day while at work. 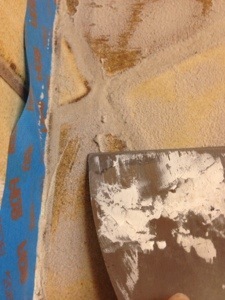 THURSDAY: In evening sand and then apply second layer, allow to dry overnight and next day. 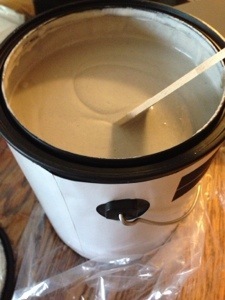 FRIDAY: Evening again, sand and apply last coat. Remove tape. SATURDAY: Sand, clean, remove and replace the tape and plastic. Then follow all directions for DAY 2. 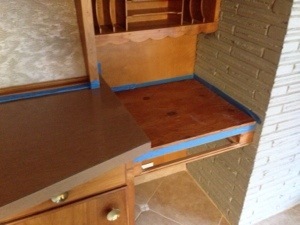 We also removed the tape on backsplash and sink at the end and allowed to cure/dry overnight. 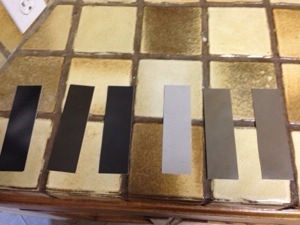 SUNDAY: Afternoon re-tape, then apply sealant, allow to dry followed by second sealant. Remove tape, plastic and dry overnight. We can’t wait to share more of the “after” pics in the coming weekends. 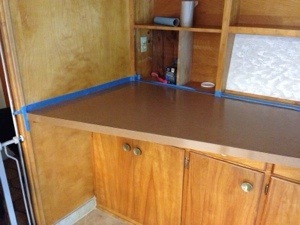 Especially with our updated backsplash and painters tape gone, the countertops really pop! We are truly grateful of Encore’s generous support and their beautiful product! We couldn’t be happier with the results! Thanks everyone for hanging with us, more make-over posts to come…Happy Sunday everyone! 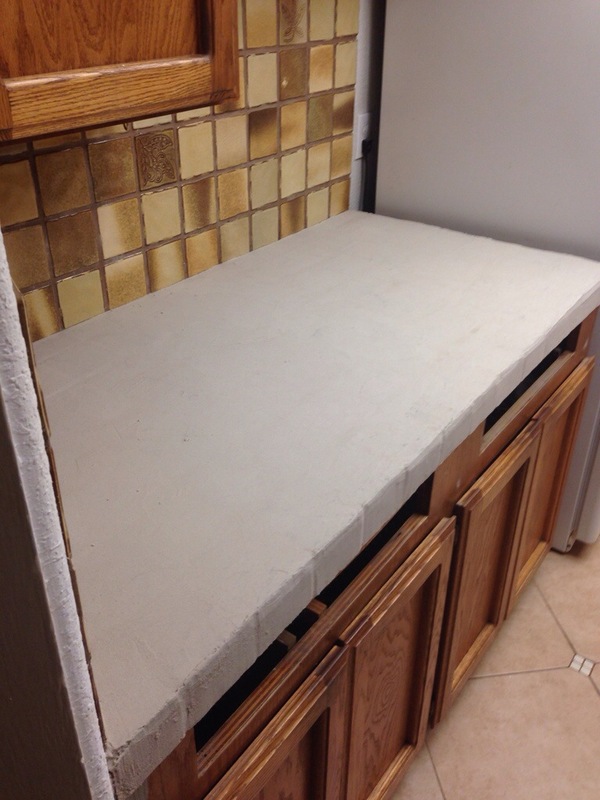 This entry was posted in Projects and tagged cement countertops, concrete on ceramic tile counters, diy, diy countertops, easy, encore, encore countertop system, helpful hints, how to, inexpensive, laying cement on tile, reviews, river rock, tips by Tandra. Bookmark the permalink. I am amazed at how good this came out!!!! Nice job guys! 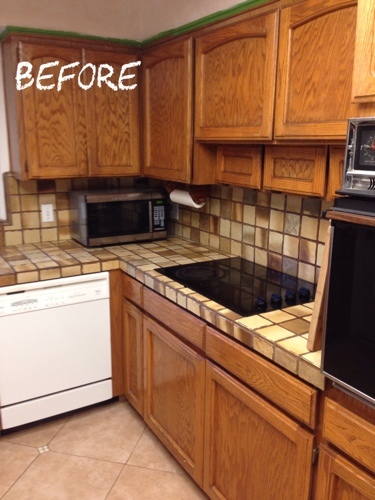 One step closer to a modern kitchen! Thanks Sarah! We’re getting there, I can’t wait to see what you’ve got planned for yours! Looks great! What a huge difference. How is the sealer working? 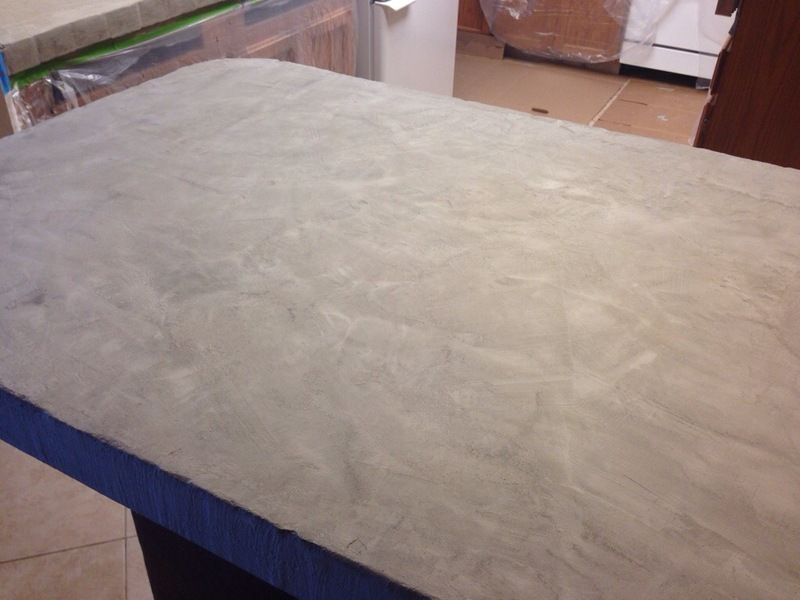 Hopefully Encore products are treating you better than my attempt at concrete counter tops. 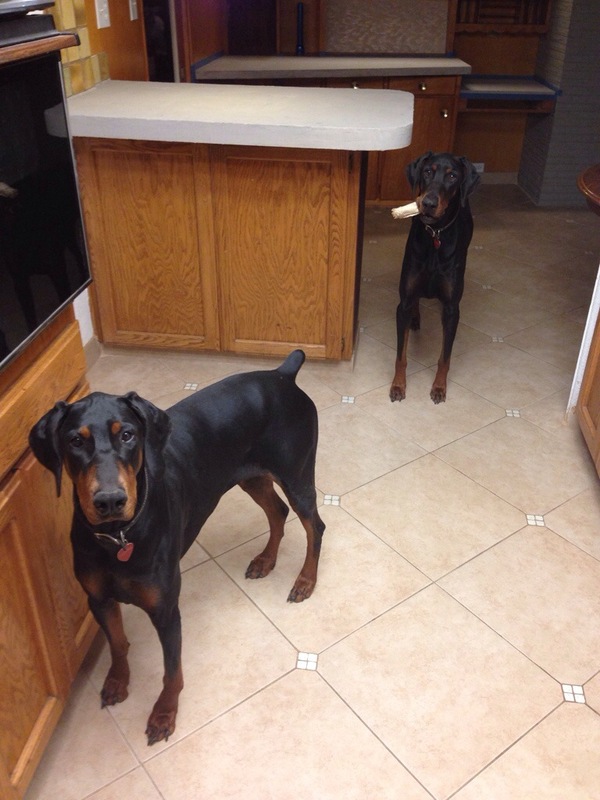 Your pups are so cute by the way. Trust me I understand the fun of working on projects with two big babies who are sure they still only weigh 10 lbs. Thank goodness I stumbled upon your wonderful blog! 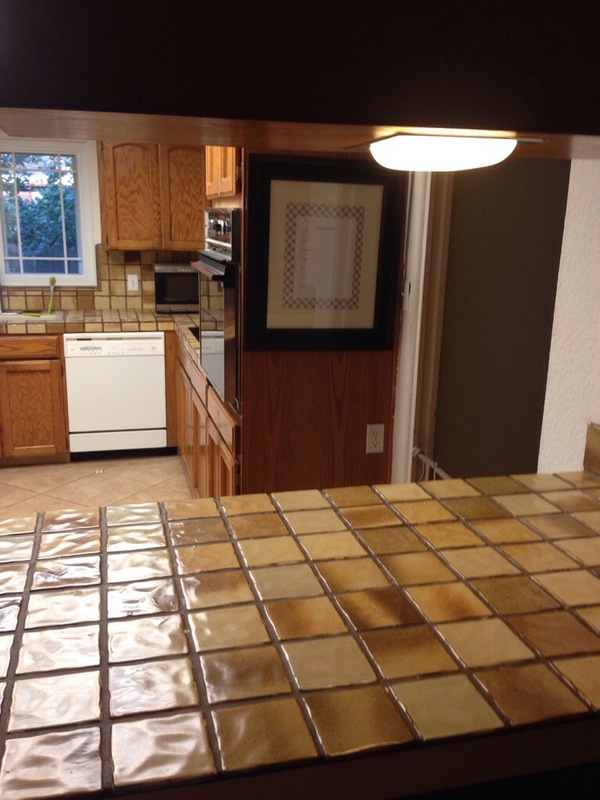 We have similar tiles (I hate the unevenness and gigantic grout lines) but in a different color. They are awful! 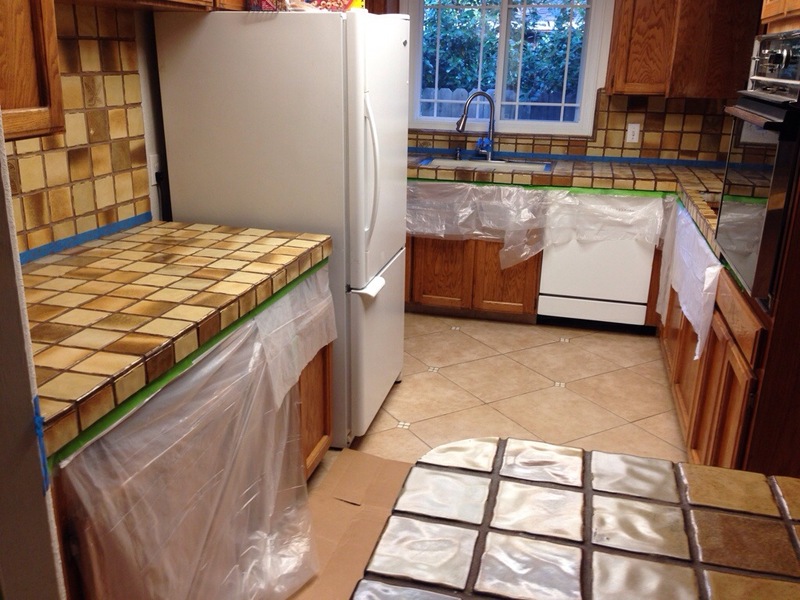 We’re not ready to fork over our entire bank account to remodel the kitchen. So, my husband us gave me the thumbs up when I showed him your post. 1. How is it holding up so far? Stains or scratches? 2. Does it soak up water? 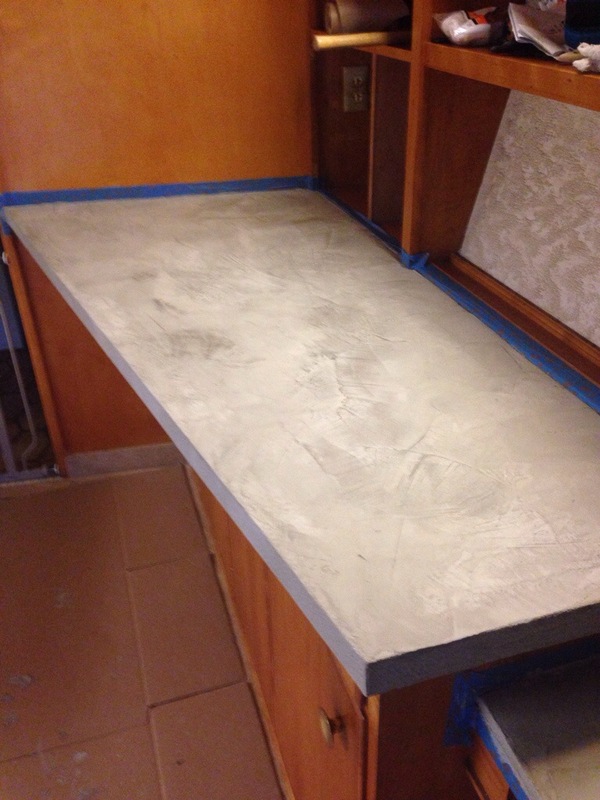 I know you sealed yours – but I read a few stories where the water still soaks in even after sealant is applied (not the same product, just diy cement overlay). 3. How does it tolerate heat? (Ie, hot pot/pan placed on top). And if you have any advice/tips for me – I will more than appreciate it. 2. 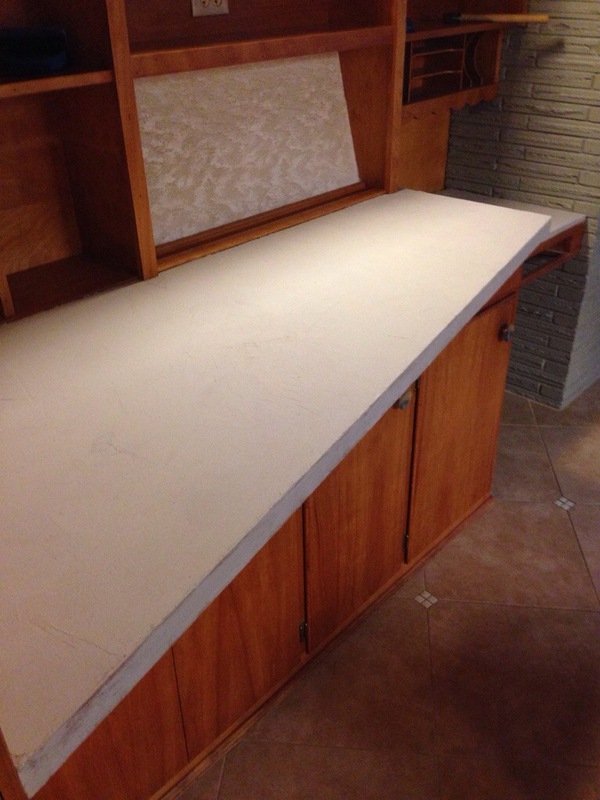 The countertop kits come with two sealants and the water droplets sit atop the counter, no sinking in so far. (Hubby is notorious for not drying up after himself or allow standing water) However no soak through yet. 3. We don’t let anything hot sit atop the counters. Instead we have two big bamboo cutting boards, and a couple metal pot holders/trivets. 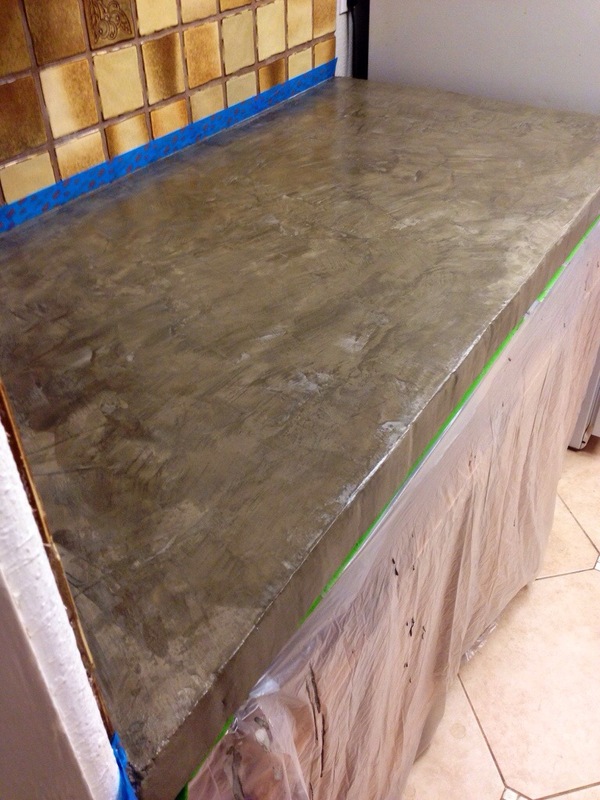 I bet the counters are tough but we don’t want to risk it cause we don’t want to ruin the sealant. I am so glad I found your blog. Thank you for sharing. 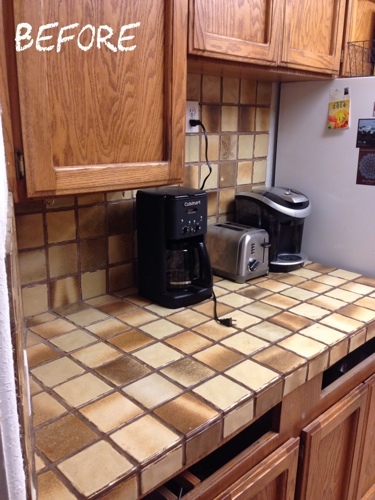 I was thinking about doing this over my God-awful navy blue tile countertops that I absolutely DESPISE. You have convinced me to try it! Thanks for the helpful tips. 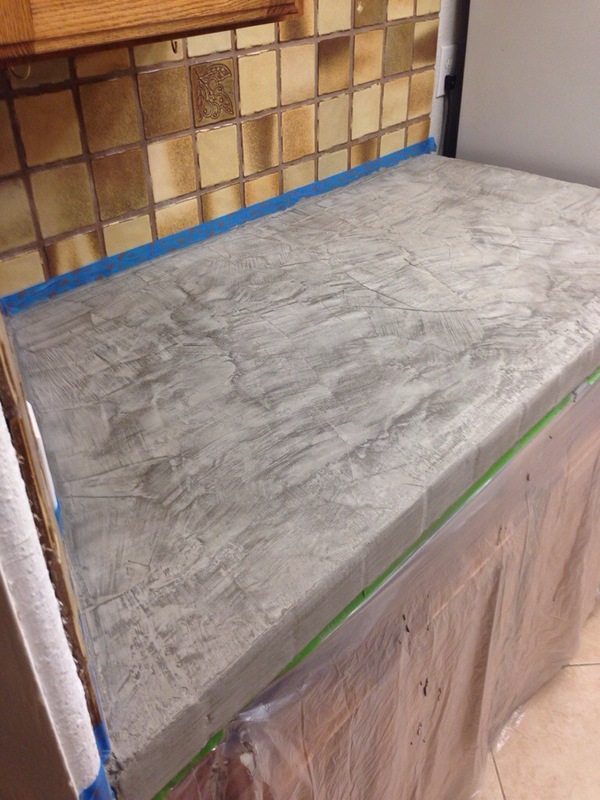 I don’t think my tile is quite as textured as yours, although my grout lines are thick, so I will definitely be doing the 3 coats of superbond. Do you have pictures of before and after? We have navy blue tile here too. I’m so happy we could help! Good luck with your project, I’m sure it will turn out fabulous! EXCELLENT! I now understand “grooviness” 🙂 Thank you for being brave enough to tackle this and sharing your results. Thank you so much for posting about this process! 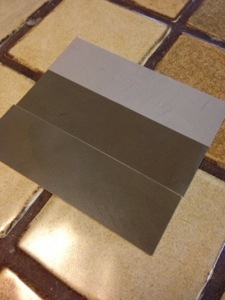 We have exactly the same horrible tile as you and are currently in the process of ordering our Encore materials. 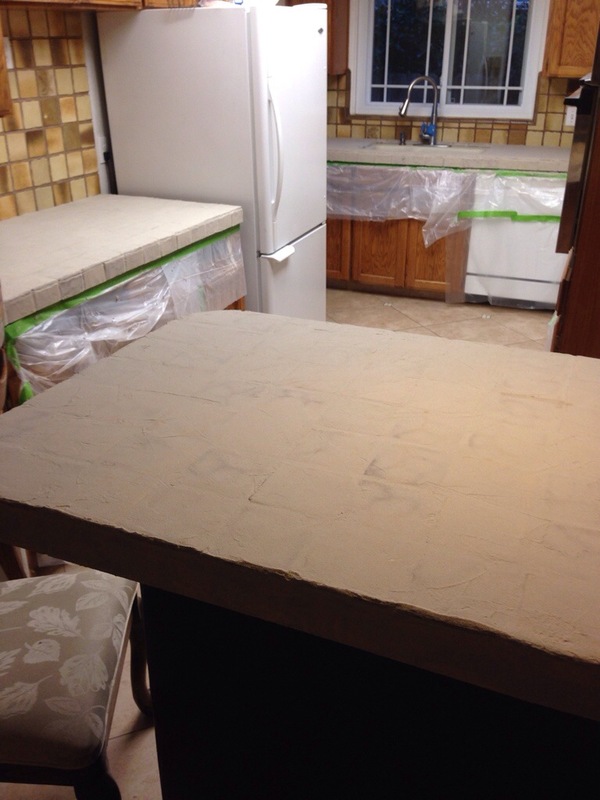 We have a little less than 50 square feet of tile space but (based on your advice) I’m planning to order an extra can of SuperBond. In the end, was 1 extra can all you needed? Thanks again for your post. We have been referring to it constantly and appreciate all of your advice!